Barbara Steele, Anthony Steffen. In French with no subtitles. Recently upgraded! 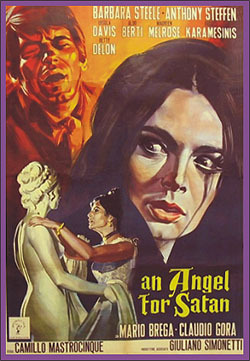 Barb has a dual role in this excellent horror film about a girl possessed by the spirit of a statue. Her strong performance helps to enhance the dreamily melancholic atmosphere of the house and its grounds, overshadowed by a mysterious lake. This was Barbara's last major Italian horror film. Transferred from a beautiful, widescreen 35mm print. Cool.